Yesterday VideoCardz unearthed a PDF data sheet on the official HP website for an as yet unannounced AMD Raven Ridge APU powered laptop. The Envy x360 15-bq101na became the first laptop known to come packing a Zen/Vega APU; the Ryzen 5 2500U. Later in the day another next-gen APU leak arrived - PCPerspective published a benchmark set claimed to be from a laptop powered by the Ryzen 7 2700U. It looks like systems makers are starting to line up product releases based around AMD’s highly anticipated Raven Ridge APUs. A few hours ago it was possible to download an official spec sheet for the HP Envy x360 15-bq101na, powered by a Ryzen 5 2500U with Vega Mobile. According to the (now removed) document the processor at the heart of this laptop came with a quad-core Ryzen 5 CPU boasting a 2GHz base frequency, up to 3.6GHz burst frequency, and packs a 6MB cache. Integrated graphics power is supplied by Vega M.
The new Envy x360 includes other attractive supporting components such as a PCIe NVMe M.2 SSD, a multi-touch enabled FHD IPS micro-edge display, B&O stereo sound, and can be equipped with up to 16GB of RAM (8GB installed in single slot in the base config). This sleek looking laptop boasts up to 10 hours of battery life. 3DMark11 graphics and physics scores from an AMD Ryzen 7 2700U system have been shared by a Reddit user. Tech site PCPer has compared these scores to those achieved by 8th gen Intel Core i7 powered laptops with and without discrete graphics. The early results, in the table below, show that the AMD Raven Ridge APUs could well provide a “winning combination for mobile performance,” reckons the site. In the table above you can see two new Core i7-8550U laptops, one with an Nvidia GeForce MX150 discrete GPU and another relying on integrated graphics of the Intel processor (UHD Graphics 620). 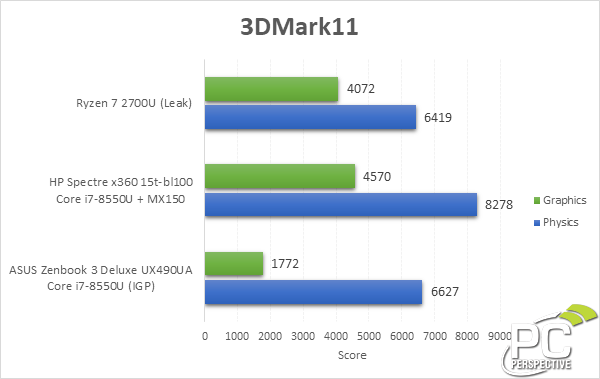 The chart shows some discrepancy between the Core i7 laptops in physics scores, and of course the MX150 provides a significant boost in the graphics score. We don’t know as yet the true power consumption of the Raven Ridge APUs but it is thought that they could indeed be lower than a combined Intel CPU and Nvidia GPU mobile solution (~35W). The resulting next-gen AMD APU laptops are hoped to provide an attractive balance of performance, battery life, and price. Slow single channel DRAM with a GPU that shares the memory bandwidth with the CPU? Seriously? Is this supposed to be a budget laptop? 2400Mhz isn't slow for SO-DIMM and I'm guessing they choose to go with a single 8GB stick because adding another would've added £150 odd to the price, probably not something they wanted to do for what i guess will be a low to mid-range notebook (£600-700). It's the 2nd slowest speed available and 8GB DDR4 2400Mhz SO-DIMM are available for around 70 GBP. Source? As when i looked on HP's own site the fastest DDR4 SO-DIMM they sell are 2400Mhz and cost around £150 for a single 8GB stick. Yes, a retail sourced 8GB DDR4 2400 SO-DIMM will set you back around £70. But there's no testing or compatibility guarantees with those. So you pay a premium for the fact that HP have “specially” sourced the RAM and guarantee it in conjunction with their laptop. Another 8GB of DDR4 fitted at factory is likely to slap at least a £100 premium on the retail price.